Australians love gardens but current unfortunate conditions mean it’s very hard to have a healthy, thriving lawn. Osmocote Lawn Builder has been used for many years on famous golf courses like Cypress Lakes, as well as major venues like the MCG and the Olympic Stadium. Osmocote is the number one granular lawn fertiliser in Australia. The Osmocote Lawn Builder Repair and Starter kick starts your new or damaged lawn. The Slow Release Lawn Fertiliser gives long term care by releasing nutrients to the grass plants when they need it most. The Lawn Builder with Weedkill protects from unwanted intruders. Osmocote Lawn Builder is particularly useful right now because it contains a Wetting Agent so it makes the best possible use of moisture on the lawn. Now’s the perfect time to use Osmocote Lawn Builder with Wetting Agent. Lawn Builder with Wetting Agent is superior not only because of its strong professional heritage but also due to the brilliant Osmocote controlled release technology. Unlike other, supposedly similar, products, Osmocote releases nutrients according to the soil temperature and moisture. So, it’s never a feast or a famine just a constant, steady diet to promote vigorous, healthy growth. Osmocote is environmentally friendly. Since 98% of the fertiliser feeds the plants, no surplus runs off to end up in the waterways. 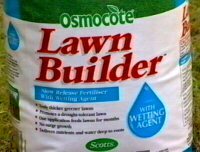 And Osmocote Lawn Builder’s nutrients are specially formulated to be released, as needed, for as long as 2 months. Osmocote Lawn Builder with Wetting Agent is perfect for right now and all through summer. However, you need to take care of your lawn all year round - and Osmocote can show you how. The only way to truly see just what a difference Osmocote Lawn Builder can make to your garden, is to give it a try. Remember the name – Osmocote – because there are others that can look confusingly similar. Your lawn needs your help – so trust Osmocote Lawn Builder. Available from all leading supermarkets, hardware stores, all fine nurseries and garden centres.